As anyone with a crippling cheese addiction knows and has loudly exclaimed on occasion, "You can never have too much cheese." But, apparently, the United States has somehow found itself with exactly that: too much damn cheese. So much that the government is bailing the cheese industry out. Really. In a move aimed at reducing the nation's biggest cheese surplus in 30 years, the Department of Agriculture (USDA) announced this week that it will purchase roughly 11 million pounds of cheese from private cheese producers' inventories and ultimately donate it to food banks across the country, according to a report by CNN. 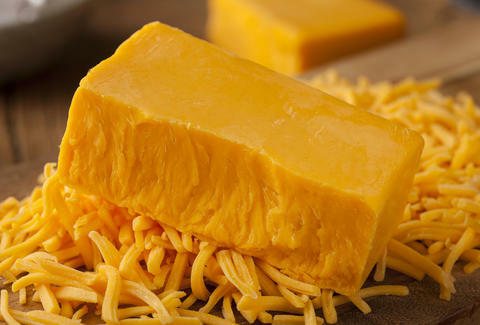 The massive cheese buy is valued $20 million, which is a lot of, uh, cheddar (we'll show ourselves out now). The bailout will provide a big boost to the nation's curdled dairy industry, which has been shredded by a blend of challenges such as slowing demand for cheese, high milk inventories, and low prices, among other factors, per the report. This all comes despite Americans' record cheese consumption of about 35 pounds per year, a number that seems kind of low if you think about how much cheese you consume via pizza alone. "We understand that the nation's dairy producers are experiencing challenges due to market conditions and that food banks continue to see strong demand for assistance," said Agriculture Secretary Tom Vilsack in a press release. "This commodity purchase is part of a robust, comprehensive safety net that will help reduce a cheese surplus that is at a 30-year high while, at the same time, moving a high-protein food to the tables of those most in need." But don't be fooled by the government's cheesy ploy, folks. Obviously, this is just a massive cover-up to account for all the cheese they'll need to stage another moon landing. Tony Merevick is Cities News Editor at Thrillist and loves cheese. Send news tips to news@thrillist.com and follow him on Twitter @tonymerevick.